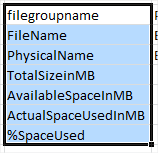 In this article we are going to cover How to Display Space Details for Given database. How to Display Space Details for Given database? This script will display Space Details for Given database . LEFT OUTER JOIN sys.data_spaces ds ON df.data_space_id = ds. Hope you will like How to Display Space Details for Given database.